The love it or hate it MINI Countryman now has one less reason to hate it. 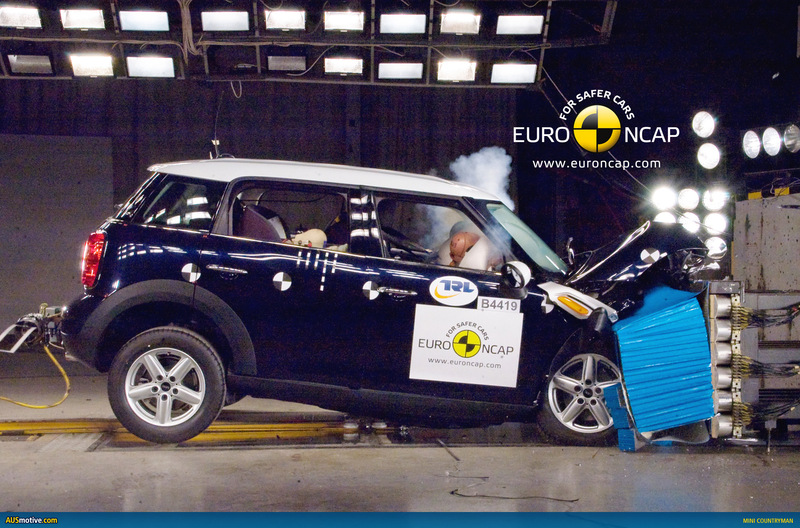 It’s performance at the latest round of Euro NCAP testing saw the not-so-MINI awarded a 5-star crash rating. The Countryman scored 84% for the Adult Occupant category, 83% for Child Occupant, 63% for Pedestrian and 71% for Safety Assist. Interestingly the model tested was a right-hand drive Countryman Diesel, so these results are directly relevant to the Australian market. Most cars tested by Euro NCAP are left-hand drive. You can read the full Euro NCAP report HERE. After the break you can watch video footage of the Countryman’s test, as well as reading the press release from MINI PR. 5 stars for the MINI Countryman. The new MINI crossover earns top rating. 25.11.2010 Munich. The MINI Countryman breaks new ground in delivering the brand’s hallmark driving fun to anything up to five seats, while simultaneously taking on role model status in terms of safety. The first MINI model with four doors and a large tailgate has claimed the top 5-star score in the latest Euro NCAP crash test results. In this internationally recognised test programme – which was further tightened in 2009 by the addition of more test criteria – the MINI Countryman put in a convincing performance with its wide range of standard-fitted safety equipment designed to ensure highly effective occupant protection for both adults and children in various types of collision. Alongside the high levels of active and passive safety designed to reduce the risk of injury inside the MINI Countryman, its pedestrian protection measures also played their part in securing the top rating. The high degree of occupant protection in the MINI Countryman is based on a holistic safety concept that is applied to all brand models. Robust load-path structures and precisely defined deformation zones ensure that the impact forces in a crash are absorbed in specific areas and kept away from the highly rigid passenger compartment. The load-path structures in the floor section, side members, bulkhead and front and rear of the vehicle are coordinated in such a way that the impact force is dispersed among as many body elements as possible and does not reach the passenger cell. Among the equipment protecting the passengers inside the MINI Countryman are front and side airbags, curtain head airbags covering both rows of seats, three-point inertia-reel seatbelts for all seats and ISOFIX child seat attachments in the rear. The front seats have belt tensioners and belt force limiters, while the safety steering column of the MINI Countryman also comes with a deformation element. The body structure, restraint systems and safety electronics are perfectly coordinated to minimise the consequences of any type of collision. The technology contributing to the MINI Countryman’s active safety includes Dynamic Stability Control (DSC), which is fitted as standard. This system comprises not only ABS anti-lock brakes but also Electronic Brake Force Distribution (EBD), Cornering Brake Control (CBC), Brake Assist and Hill Assist. The MINI Countryman also has a runflat indicator as a standard feature. This system monitors the tyres and uses a visual signal in the on-board computer display to alert the driver to any tyre damage. The test procedure of the NCAP (New Car Assessment Programme) is considered one of the most rigorous in the world to be applied to new vehicles. Governments, automobile clubs and consumer associations across Europe acknowledge the Euro NCAP test as the benchmark for vehicle crash safety. The test profile includes a frontal collision, a side-on crash and a side impact against a steel post. 2009 saw the introduction of further criteria with regard to electronic safety features as well as to additional injury risks in a wide spectrum of collisions. Beyond these considerations, the Euro NCAP crash test also attaches great importance to pedestrian protection. The MINI Countryman takes account of these demands through elaborately formed body elements with yielding structures at the front of the car, which help reduce the risk of injury to pedestrians and cyclists. The testers awarded the maximum number of points for the front bumper and front-end elements with regard to the risk of head injury to children in the event of a collision. The MINI Countryman is the second of the brand’s current range of models to undergo the Euro NCAP crash test and immediately scoop the top 5-star rating. Prior to this the MINI Cooper had already secured the coveted maximum score from the independent NCAP testers by virtue of its comprehensive standard-fitted safety features and its exemplary crash behaviour in a diverse range of collisions.